The idea of storytelling in advertising is stronger than ever, and now there are more ways then ever to do this. 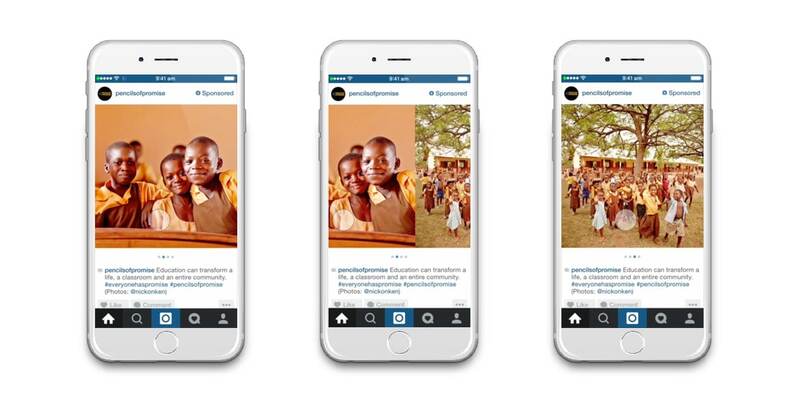 Instagram’s carousel feature allows you to display a series of images in one post by simply swiping through. Here are a few pointers when using the carousel feature for creating advertising material that’s visually thought-provoking and effective…. This means the first image you use to start your story (advert/promotion), has to capture your audience’s imagination from the get-go as some users may not scroll through your carousel. The whole point of a story is that it’s meant to take you on some kind of journey. Using progressive images helps you do this and takes the focus away from the fact that you’re advertising a service or product. Divert the attention away from the fact that you’re advertising something and place your user in the middle of a scenario or story that they’re likely to react to. A reaction doesn’t have to be positive or negative, it just has to be impactful. Give your user an introductory image that’s going to intrigue them and want to see more. You can do this by obscuring part of an image and leaving something out that you’ll resolve for your audience in the following image or in the next carousel that you post. Remember those BT adverts that centred around a family’s daily life? It became a talking point because viewers found themselves caring about the family and their actions and as a result, wanting to view the next ad. Emulate this same intrigue and you’re away. Don’t limit yourself to just progressive posts, just one-off images or the same old colours and layout. Challenge yourself and your users by constantly varying your stories and the way in which you tell them. Read blogs such as this one to open yourself up to more possibilities if this isn’t coming to you very easily to begin with. Using Instagram for business is a creative process and should be approached this way! Be meticulous in the way in which you lay out your images but don’t be afraid to take risks either – the Carousel feature is your chance to project a snippet view of your graphic design skills to the world! You’ve got a world of filters and editing at your hands – use it wisely! Don’t over-use it either! Make each image in your carousel worth looking at. Try out a few filters and see what resonates with your users. Take a look at some of the brands who are excelling with Carousel such as Air B&B and ASOS. Maybe you can pick up a few additional tips from studying these.